Food is a central theme this time of year. When you are making and giving homemade goodies, don't forget about your four legged friends. The traditional cookies that fill our memories aren't suitable for our dogs, but we can make dog cookies that look like our favorites with dog safe ingredients. 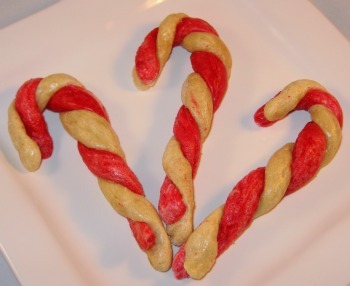 How about a Sugar Free Candy Cane Dog Treat - Twist plain and red dough for a familiar shape. Sherri from Canada had a great experience making this recipe. Read her review and see Tyler enjoying the results!. A second and delicious traditional cookie is the Gingerbread Man - These have none of the unhealthy sugars as their seasonal counterparts. There's no need to keep the shape of the gingerbread man, Hollie from Montana used all different shapes and her dogs loved them! 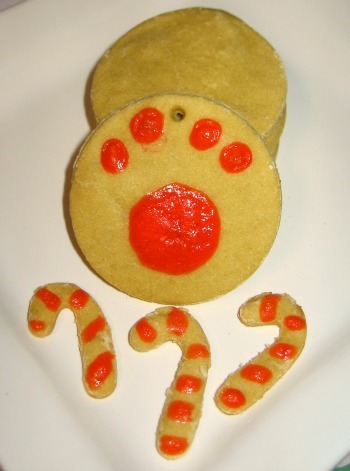 Whether your gift is homemade dog treats or not, you can make an edible gift tag dog treat. It's really simple, and super customizable. Our Gluten Free Dog Treat Recipe is a good place to start. Roll out the dough, cut out a circle or other simple shape. Before the dog treat is baked, use a straw to cut out a tiny hole at the top. Next, make a batch of our egg paint icing and write the dogs name on the unbaked cookie. Once the treat is baked you can thread the hole with ribbon and attach it to the gift. A gift for yourself is also a gift for your dog. If you have a busy schedule (and who doesn't) then you need quick and easy dog treat recipes. 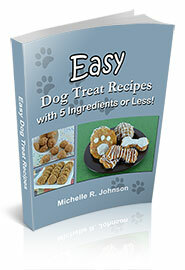 Treat yourself, and your dog, to my first eBook full of easy, quick and healthy dog treats. Step by step photos help you see how to make each recipe. Plus there are substitutions to customize each recipe to better fit your individual dog. 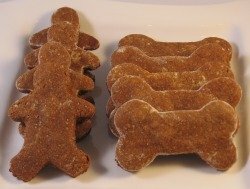 Don't let distance determine whether or not you give healthy homemade dog treats as a gift. Review my helpful tips on how to ship dog cookies, then pick a recipe and send a little love to a very fortunate dog. "You are so helpful, thank you so much! Nobody has given me anything but short answers and I don't knows, except you. Thank you for your help!" "Wanted to let you know that I have used some of your recipes and told neighbors about you. We have a wonderful neighborhood and I started a Critter Coop where we help each other with our animals. I generally have a couple of Coop parties a year. This year I had a Cookie Exchange and everyone had to bring Homemade Dog snacks. We had so much fun trading our goodies. Now a lot of us are baking at home for our critters and the dogs LOVE it. Thanks for your site!"